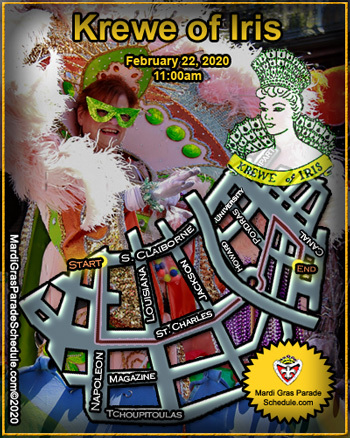 Founded in 1917, the Krewe of Iris is the oldest of all female Carnival Krewes in New Orleans. Named for the Goddess of the Rainbow, Messenger to the Gods, it maintains a global membership of 900 active riders. The organization's inaugural tableau ball was celebrated in 1949 and was the first such event to ever be televised. First parading in 1959, the Krewe continues to strictly follow the traditional Carnival parading customs of wearing white gloves and full-length Carnival masks. Our goddess has been kind to us, to this date the organization has never cancelled a parade due to inclement weather.